Yesterday, I posted about my niece's 1st birthday party and the banner garlands I made to decorate. 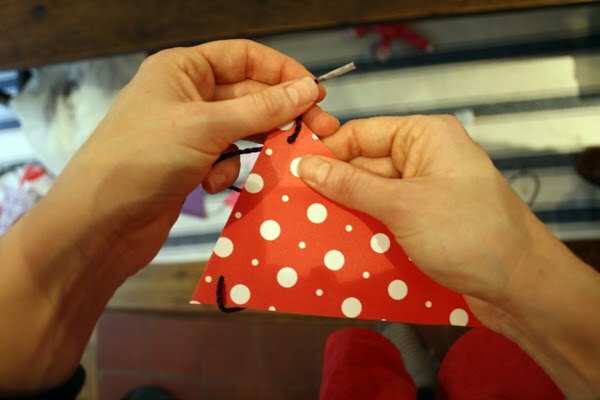 Today, I thought I would walk you through the super-easy steps to make one for yourself! What's cute about the banners is that they can be made in any color combo and instantly add a festive party vibe to any space, be it a Manhattan apartment or a suburban park (oooh, I just got cute tingles thinking about a bunch of these strung from trees over a picnic table). I could see them at a birthday, shower, or anniversary party, or even at a playful wedding. You could also add a letter to each flag to spell out a cute message ("Just Married"? ), or the name of the birthday boy or girl. I think they'd also make for cute decorations in a kid's bedroom, or as a pretty sweet alternative to a mobile over a baby's crib. But don't read anything into that- I'm still very happy just celebrating other people's banner occasions! 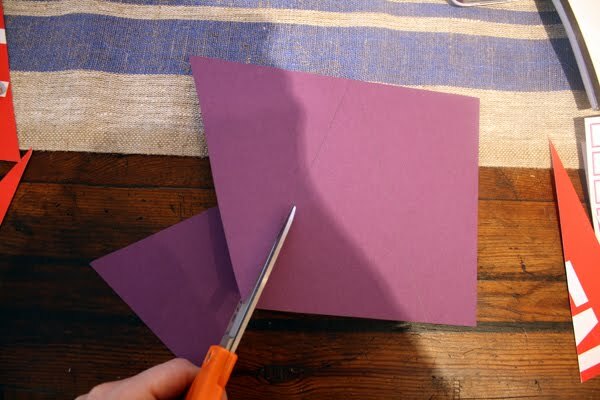 Step 1: Make a triangle template for your banners. I used a junk-mail postcard to make mine. I simply measured the center of one side and cut diagonally to each of the opposite corners. You could make your triangles longer or bigger according to your taste (or really tiny would be adorable, too). 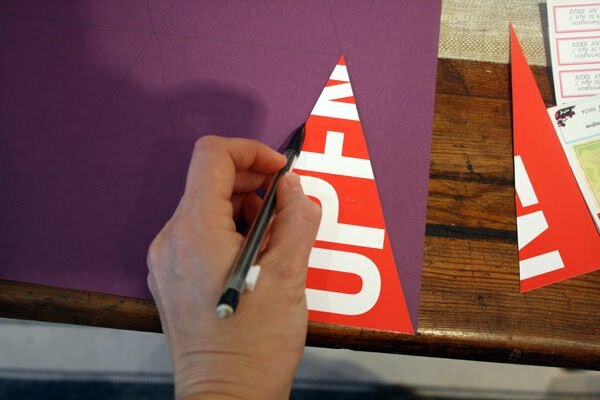 Step 2: Use your template to trace your triangle shape onto your papers (hint: if you reverse the direction of the triangle each time, you will waste very little paper). 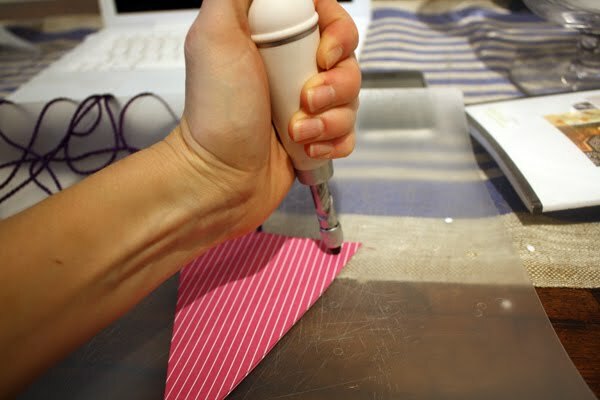 If you are using patterned papers that are printed on only one side, use a gluestick to attach them back-to-back before you trace your triangles. Step 3: Following your pencil lines, cut out the triangles. 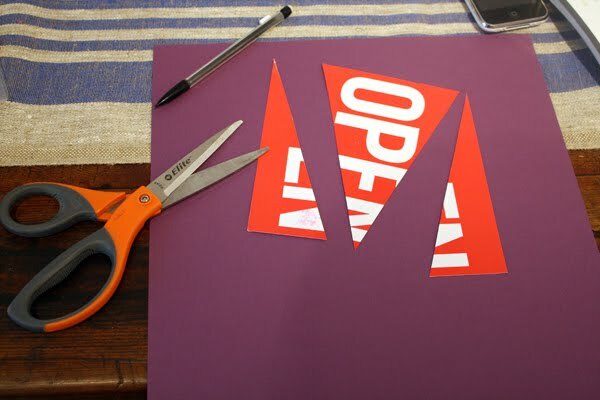 If you are a perfectionist, you can use an Exacto blade and a cutting mat, but I found that scissors did the job just fine. Step 4: Punch a hole in each of the upper corners of the triangle. I used a Japanese hole punch to make a smaller hole, but I think a regular hole punch would be fine. 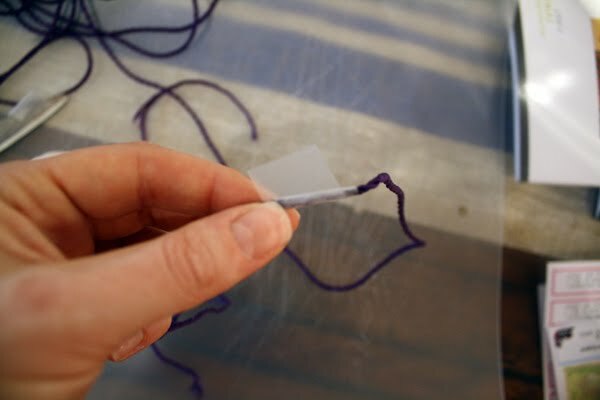 Step 5: Wrap the end of your twine, cord or ribbon with tape, and snip off the end to form a stiff end that won't unravel (like on a shoelace). Step 6: Thread the cord through each of the holes on each flag, always going in on the left, and coming out on the right. Slide the flags to the end of your cord and space them evenly. Try to create a random assortment of the colors and patterns- it will look cuter if you don't follow a set order. Drape them from the ceiling and have a party! I remember making banners for my kid's party and the kids loved it because they find it so festive and happy. And it's so easy, they can help! I can't wait to make Sofia act as my little project elf once she gets a little more control over her motor skills.